Like most other preachers, I receive a number of church bulletins every week; approximately 75-80 bulletins cross my desk every week. These bulletins come from a number of different geographical locations and have different goals which they aim to accomplish. A large amount of the Lord's money is being used each week just to get the bulletin mailed out to brethren. Just how much good is being accomplished through this medium of teaching? Having personally edited a bulletin for six years, I feel somewhat qualified to analyze the amount of work which it takes to put out a, good bulletin. Too, I know something of the costs which are involved in putting out a bulletin. However, I felt that my personal exposure to bulletins might be too limited to make the general statements relative to bulletins which I wanted to make in this article. Therefore, I wrote a questionnaire which I mailed to those who are sending me bulletins; over half of those to whom I mailed this questionnaire responded. My analysis of bulletins is drawn from the 36 responses which I received and my own personal exposure to publishing a bulletin. Although there is no such thing as an average bulletin, I felt that I had to get some kind of average bulletin and then treat it as a specific case to make any sense out of this article. Hence, I averaged together the various statistics given to me from the 36 responses which I sent out to come up with this composite picture of the average bulletin. The average bulletin published among us has 66 % circulation among Christians and 34 % circulation among non-Christians. Its mailing list is composed of 1269 names. The articles are written by the local preacher 69% of the time with the remainder being written by "anonymous" or "selected." The preacher devotes approximately 10 hours of his time to what work he must do to get that bulletin in print. In the following assessments of the cost of bulletins, these figures will be used. How Much Does Our Bulletin Cost? Brethren, your local church bulletins are costing you a good bit more than most of you realize. From the bulletin statistics which I have compiled, let me show you how much it costs to publish a bulletin. If you went out and hired the printing done, you could get the job done for $29.84 per issue at one of the local quick printing establishments. Yet, one has to add the cost of labor on top of this expense. The preacher has already invested ten hours of his time to putting out that bulletin. I would suppose that the average preacher is getting close to $300 per week (housing allowance included); based on a forty hour week (when was the last time you saw one? ), his labor is worth $75.00. Forgetting what labor has been contributed by the members and adding $10.00 for postage, your weekly bulletin would cost you $114.84. Maybe you think that this figure is high because of the printing bill. Let's compare the figures we receive by going the other route to see how much money is being saved by printing it ourselves. First of all, the church must make an initial investment of $1500-2500 to purchase the necessary equipment to print its own bulletin. This equipment will be used equipment. The weekly paper bill will be $6.02, if there is not one sheet of paper wasted. The church then must decide whether it is going to make its own plates or hire someone to have its plates made. If it decides to make its own plates, it will need a camera, dark room, and supplies; once this initial investment is made, making plates is relatively inexpensive. Four years ago, I was hiring our plates made for $9.00 which was cheap at that time. So, a person has at least $15.00 in supplies for doing his printing at the very least. Hence, the one doing the printing is making $10-15 per issue. However, one should consider what quality of work will be produced by the preacher versus that which is produced by the professional printer. Frankly, I would be embarrassed to hand out some of the bulletins which I receive because of the quality of workmanship which has gone into the printing of the bulletin. I have seen very good material wasted because of the printing job which was being done. For me, I would rather see the bulletin hired, even if it costs a little more, in order that the quality of work will always be the very highest possible. Someone counters that this cost is excessive because the preacher's wages are added to the cost of the bulletin whereas the preacher must be supported anyway. While it is true that the preacher will be supported even if no bulletin is published, somewhere down the line brethren are going to have to grapple with whether or not it is a wise use of the Lord's money to use the preacher to publish a bulletin. Having published a bulletin, I know from experience that there were many times when I needed to be preparing a lesson, going to visit someone, teaching a Bible class, etc. when I simply could not do it because a bulletin deadline had to be met. Hence, I was using my time typing, writing, or printing a bulletin when things more important needed to be done. Later in this article, I shall try to assess the good accomplished through bulletins. I fear that most brethren whose money is being used to pay for our bulletins have the concept that these bulletins are going into the homes of unbelievers and are going to be effective in converting them to Christ. Of the 36 bulletins surveyed, only 6 had a larger percentage of readers who were non-Christians than it had as Christians. The average bulletin had a readership of 66% Christians out of the 1269 which were mailed. Since 1 do not know many congregations with memberships exceeding 1269 persons, I am forced to conclude that most bulletins have an audience of Christians all over the nation. Bulletins published by local congregations are going all over the nation and, I fear, that most of them are going into the homes of brethren who are already the strongest members in other congregations. Frankly. I have serious doubts that the local church is much benefitted by a bulletin such as is our average bulletin. It will not likely reach any of the neighbors in the community to win them for Christ; it will not likely reach some unfaithful Christian in the neighborhood and make him want to be reconciled to his Lord. It will not accomplish these great goals because it is not being mailed to these people. Most bulletins, my brethren, are brotherhood papers, no more and no less! Why then are so many congregations publishing bulletins? In the survey which I mailed out, I asked the question of what was the aim of the bulletin, to edify the members, to reach the lost, or to relate congregational news events. The greatest percentage of responses related that the main purpose of the bulletin was to edify. Edify who? The local church? If so, why mail out 1269 bulletins all over the United States to edify 200 saints in a local congregation? If edification is the main goal which is to be accomplished, let me suggest some less expensive alternatives. James E. Cooper publishes a weekly bulletin to be used by local churches which has the local congregation's own name, address, and service information on the back for the very reasonable price of 40 per bulletin when mailed in a group and 50 per bulletin when mailed directly to the recipients. The quality of this bulletin is superior to that of 90% of the bulletins which I receive in content and appearance. It has a good balance of articles designed to reach the lost and edify the saints. For $10.00 a week, every member of the local congregation could receive a bulletin mailed directly to his home; that is considerably less expensive than the individually produced local church bulletins. For just a little more expense, and probably for much less than is presently being spent on the local bulletin, magazines of 16 pages length can be sent to the home of every member. 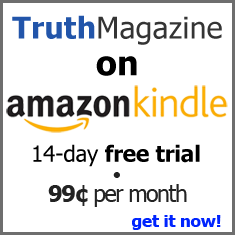 Truth Magazine, for example, will send 16 pages of good religious instruction into twenty homes four times a month for $10.00 a month. Bundles of Gospel Guardians can be sent to the local congregation at the price of 20" for each copy. Searching The Scriptures will send thirty copies of their twenty-page magazine into your members' homes for $10.00 per month. As a matter of fact, a local church could probably mail nearly every magazine published by conservative brethren into the homes of every one of their members on a regular basis for less than they are truly spending on their local bulletin. But, by hiding the costs (i.e., not considering the preacher's wages, the initial investment cost of equipment, etc. ), we persuade ourselves that the bulletins cost us very little. What Is Being Accomplished Through the Bulletins? This is undoubtedly the most difficult question to answer of the entire survey. I asked the question, "How many of the following have you gotten as a result of your bulletin in the last year? ___Contacts ___Home Bible Studies ___Baptisms __Restorations." The results were pretty much as I expected. Very few of the bulletins could attribute any results directly to their bulletin. In the six years that I edited a bulletin, I established contact with one couple which resulted in the conversion of their soul. Brethren are rather defensive about this aspect of their bulletins. I think most of us act toward our bulletins just as the general populace acts toward Congress. The general populace thinks that Congress is filled with a bunch of crooks; however, when election times rolls around, they re-elect their own congressman because they think that he is different from all the rest. Perhaps this is the way that most of us view our bulletins. Basically, we do not believe that bulletins are accomplishing much good (I hear a number of preachers tell how many of the bulletins which cross their desks end up in a garbage can after a hurried glance, but the one which we are working on is decidedly different; it is accomplishing untold good. Frankly, I think that it is time for us to take a good close look at the money being spent on bulletins. Businessmen periodically assess whether money being expended in certain areas are producing any dividends to see whether or not it is profitable to sink more money into that work. Brethren need to learn a lesson from these men. We need to assess whether or not the thousands of dollars being spent each year are producing the results which we desire to accomplish. Brethren, look at your mailing lists. Do you really want to pay for sending bulletins to faithful Christians all over the United States? Brethren, look at the amount of time your preacher is having to spend in putting out your bulletin. Could that time be better used in some other field of labor? Look at the out-of-the-pocket expenses you are making on your bulletin. Could that money be used in another, more effective means of reaching the lost? We are only discussing methods of reaching the lost and, since we are discussing methods, I am going to give my personal judgment, for whatever it is worth. I believe that bulletins at one time were very effective in reaching those among us who had headed down the institutional trail. Many families were saved from institutionalism through the work of faithful men publishing good bulletins. No doubt, some areas have had equally good success in reaching the people of their neighborhood through the printed page. However, there are more effective tactics available to you than those available through the local bulletin. For example, consider the work of the Brown Street Church in Akron, Ohio. Just recently, they invested $6,500 to present thirteen weeks of a Bible teaching program which was aired on television at 7:00 p.m. on Saturday night. The thirty-minute program is divided into two segments: -the first part consists of a panel of three people engaged in a Bible contest patterned after the TV program "Jeopardy;" the second segment has one of the local preachers asking Brother Weldon Warnock questions pertaining to a given subject. Between these two segments, the congregation advertises its free Bible correspondence course. At the end of eight weeks, the program had enrolled 400 people in its Bible correspondence course. Now, brethren, compare the results you are getting from your bulletins with what is being accomplished in this program. Providing that this congregation uses a good follow-up program, many people in the listening area can be converted to Christ. I am not trying to make any official pronouncements regarding whether any given local congregation should continue or discontinue its local church bulletin. Every congregation is autonomous; the editor of Truth Magazine cannot and should not try to dictate to churches what ways they should use their money. However, every eldership has a responsibility before God Almighty to use the money which is contributed in the first day of the week contribution in the best possible way. Hence, they have a responsibility to periodically assess what good is being accomplished through the means being used. In the event that one method is producing no results, use the money that is being spent in that area to try something different. Let us not become so tied to given means and methods that we cannot experiment with legitimate alternatives.